We love the outside reinforcement that comes with a new year and the opportunity it presents to start fresh. We are gifted a clean slate with 52 untouched weeks, 12 blank months and 365 (or 366) days to start over. We get another chance at realizing the goals that weren’t prioritized before. In the spirit of being hopeful and positive, we shake off what was and look forward to what will be when we do things better this time around. Common goals include getting fit, eating healthy, losing weight, saving money, or spending more time with family and friends. Each year, these goals have a 12/31 target date, but they usually go unachieved by the time 12/31 rolls around. Why is that? Why is it that these “important” goals don’t motivate us enough to achieve them? Why do we have these goals in the first place? Maybe the why isn’t very clear and doesn’t give these goals a higher purpose and greater meaning. I created a framework using goal pillars to address this. 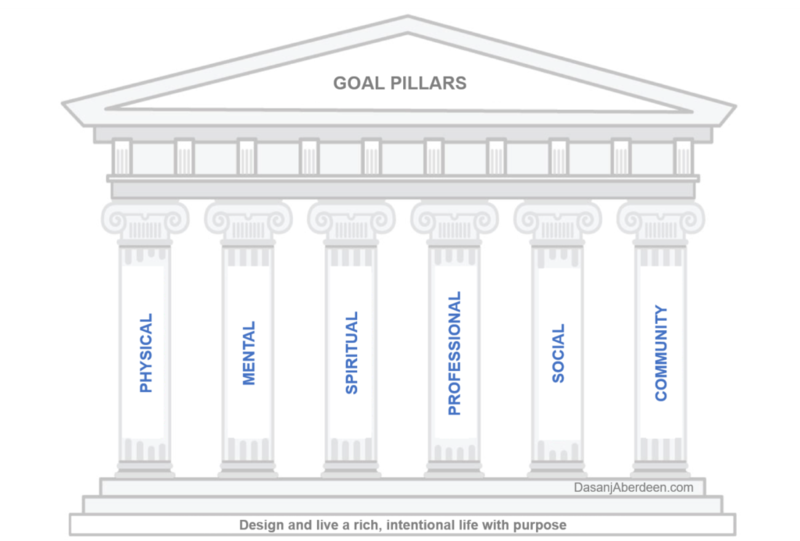 Each pillar is something you prioritize in order to have a fulfilled life and together they provide balance. Goal pillars facilitate the creation of the best version of yourself and support the overall lifestyle you want. You can use this framework to simplify the goal-oriented changes needed in your life so your vision of your future becomes a reality. Goal pillars facilitate the creation of the best version of yourself and support the overall lifestyle you want. Maintaining soundness of the body, freedom from disease or abnormality and optimal well-being where the body functions as designed. Cultivating a healthy psychological, emotional and social well-being which affects how you think, feel and act as you cope with life. Being happy, self-aware, self-confident and resilient to cope with life’s challenges and recover from setbacks. Religious faith, values, principles, beliefs, and morals. How you get along with people, how people react to you and how you interact with society. Ability to think critically, questions one’s surroundings, pay attention to current events, develop creative ways to adapt to unexpected challenges and grow from experiences. Improving a career or occupation in which you were trained by learning to earn or maintain professional credentials such a academic degrees, conferences and or other opportunities in order to advance. The great thing about goal pillars it that the framework is flexible and fluid! As new pillars become a priority in your life, you can add them and remove those you’ve achieved or that are less important. Instead of moving through life aimlessly, this gives you a tool to design and live a rich, intentional life with purpose! Here is one more example before it is your turn! 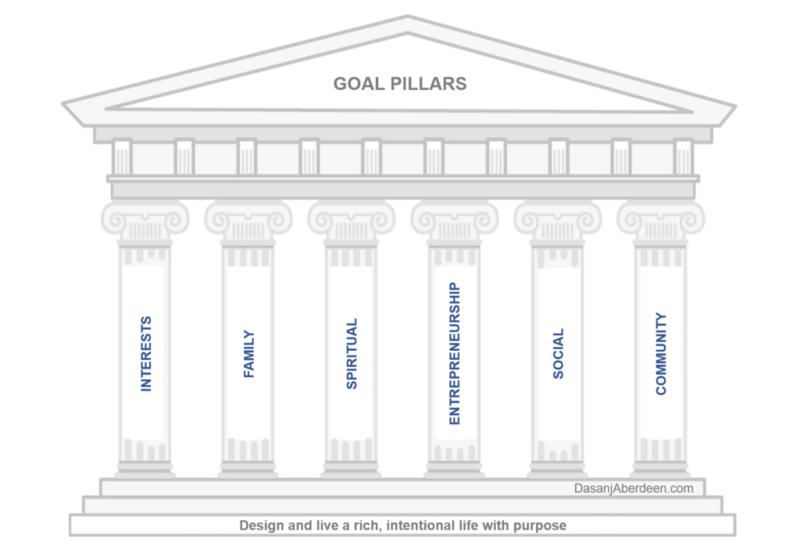 Which pillars would you include in your goal pillars? I’d love to hear how you use this approach in your own life. Feel free to share in the comments below! And pass along to anyone who could benefit from this approach!